Guest Blog from Robert Curtis – passionate Aussie motorcyclist! There’s a little bit of everything in Australia. Sea cliffs, mountains, forests, beaches, deserts, and more. There is so much to do and what better way to see it all than on the back of a motorcycle. Whether as a solo venture or with your best mates, answer the call of the road with these five must-see scenic tours. The Grand Pacific Drive is an amazing stretch of road, hugging the western coastline and cliffs of New South Wales. Starting just south of Sydney from the Royal National Park and concluding in Wollongong, the drive is simply amazing. The highlight of the drive is definitely the Sea Cliff Bridge. Trust us, you’ll definitely want to get off the bike and spend a few hours soaking in the natural beauty of the cliffs and beaches from this spectacular view. Other sites on the route include Bald Hill Lookout (Otford), Kiama Blowhole (Kiama), and the Nan Tien Temple (Berkeley). The Great Ocean Road is another coastal drive that stretches along Victoria’s rocky southern shore. There is so much to see in this region, including the Twelve Apostles (Port Campbell National Park), the massive trees and the Otway Fly Top Adventure over of the Great Otway National Park, water fun in Apollo Bay, or any of the numerous award-winning vineyards tucked away with cozy B&Bs. You can conclude your Great Ocean Road expedition with whale watching in Warrnambool between late May and early October. The Scenic Rim is a beautiful mountainous area in the interior of Queensland and is rich with heritage, scenery, and tradition. You’ll start from Brisbane and then head south through Beaudesert for a bit of culture with a historical museum, arts centre, and country festivals. Continue up towards the beautiful mountain vistas as you ride along the Queensland and New South Wales border. Your trip will conclude in the Border Ranges National Park where the stunning views will let you see all the way to the ocean. If you’ve still got an appetite for adventure, then head west towards any of the numerous national parks, such as Mount Barney National Park, Yabbra State Forest, or Wondul Range National Park. Tasmania’s natural beauty is legendary and the Great Nature Trail will show you exactly why this reputation is well earned. 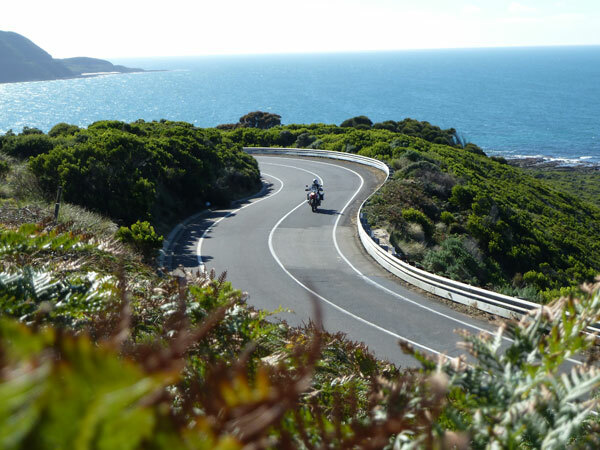 The road between Devonport and Burnie is a breathtaking ocean road with amazing scenic views that include frequent sightings of whales and dolphins. Stanley is another destination along the Great Nature Trail, well known for an interesting geographic feature known as the Nut, a stone plateau standing in silent vigil over the ocean. Starting on the coast at Coffs Harbour, the Waterfall Way will take you inland through the Dorrigo National Park and Cathedral Rock National Park. You’ll get the full bio-diversity that Australia has to offer as your drive will take you through verdant countryside, mountains, rainforest, and endless plains. A highlight of the trip is Ebor Falls, a cascade waterfall and popular photo spot for locals and tourists alike. Before you start on your trek across Australia, make sure that you’re protected and covered in case of an accident or emergency. NRMA features a large range of policies for motorcycle and scooter insurance. Learn more about your options for motorcycle insurance or call at 132 132.